The scenery was stunning, but it is on here more for the climb. 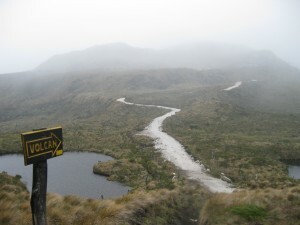 My most strenuous day, it took over 4 hrs to get to the top and the weather was unfriendly. Accomplishing something like that feels amazing and the Colombian hiking group that celebrated with me at the rim, made it even more memorable. The skies cleared for the descent and I strolled through an active sulfur mine. All things considered, one of my favorite days. The Isla was just OK and the town is not worth writing home about, but the stretch of ocean between the two seasonally contains some exciting mammals. The tour was expensive, but watching the whales jump in the air and splash around was one of the coolest things I have seen in my life. The 2nd deepest canyon in the world. Basically just a great, strenuous hike with cool things to look at. On clear days, you can see the tops of the snowy peaks down 3,140 meters to the canyon floor. 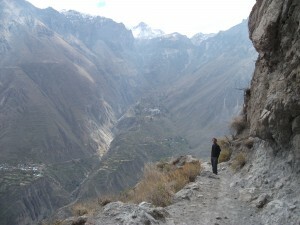 The Inca agricultural terracing and friendly locals make Colca my choice for #8. A tourist ready town at the base of the active Volcán Tungurahua. The area has lots of hiking opportunities and even more extreme sport options, that I decided not to pay for. I just walked in search of eruption views. Occasionally, smoke would billow from the top and rumbles could be heard all over town. I found out later that the eruptions were rare, as not many other travelers reported seeing the impressive sight. As with a few other places I visited, I was there at the right time. A high altitude island on Lake Titicaca. I could hike around all day and then rest my head for less than $3 per night. The ticket takers, with their greedy little hands, were annoying, but the weather was perfect and the wandering was boundary free. 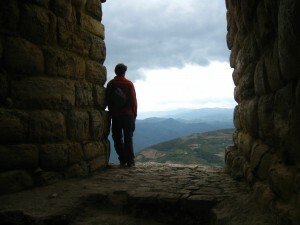 An Inca fortress set on a hilltop, with great views of the surrounding valleys. I loved the site, but the fact that you can reach the place via a 3 hr hike from the town of Tingo, pushes it up my list. Towering snow capped peaks, colorful mountain lakes, numerous hiking trails, this place is amazing. Just staring at the extreme heights of the place, containing 33 hunks of rock over 6,000 meters high, was cool. With more money and time, I could have explored the space better, but I was happy with my budget touring. I wasn’t expecting much when I walked to the edge of the crater, but that first view made me say “Wow!”. Staying in a hostal, steps from the rim and at an elevation of over 4,000 meters, I enjoyed it all. A spectacular hike circles around the crater lake and the bus rides between nearby towns are guaranteed to be memorable. The freezing cold temps at night can easily be fought off with an open fire. My love for this place has been well documented, with it’s unreal scenery and unique wildlife. Why is it not at the top of my list? Because – I had to use a tour and memories of being painfully cold are still fresh in my head. Why it’s #1: If I had to choose one place to go back to and spend a week, this would be it. 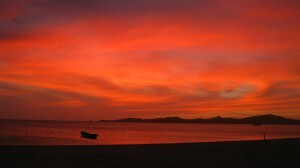 Multiple quiet beaches, warm weather, hammocks, climbing hills, a salt flat, unbelievable sunsets, and very few tourists. I was able to wake up everyday and decide between just laying on the beach, hiking a rugged coastline, or doing both. Put this place on your list, but only if you can handle the 2 hr ride out in the back of a truck and live without a shower for a few days. Friday: My alarm sounded at 6 am, some roommates were just going to bed, I finished up my packing and walked out to the morning Bogota streets. Busy with business people and kids finding their way to school, I found my way to the local busses. I worried a little about fitting, but was able to flag down an empty bus and get on despite nearly losing a sandal. For 70¢ instead of a $10 cab ride, I got to the airport. I sat in my seat, compared it to the many bus seats I suffered in over the past 206 days, stared out the window, and tried to let it sink in that I was leaving South America. An American businessman next to me asked me my first post-trip questions and I came up with my first answers. Just 5 hrs later, I was back in the USA and it has felt weird ever since. I did my usual stroll past my food options in the Atlanta airport, slowly adjusting the price I was willing to pay to feed myself. Finally, I decided to not care, and spent over $7 on a mini-hamburger combo that included a hefty portion of chili-cheese fries. A very satisfying meal and the beginning of a week straight of binge eating. From Atlanta: A near empty flight to LA on which I could watch the Blazer basketball game due to in-flight ESPN, a painful hour of sleep in LAX, leaving my book sitting on a chair, and watching the sunrise as I embarked on the final leg to PDX. Arriving just before 9 am, 24 hrs after leaving Bogota, I was home. My triumphant strut and hugs were recorded and posted on Facebook. I ate mass amounts of breakfast food and drank a flavorful beer. I sat on the couch and watched college football. I have met friends for more flavorful drinks at bars and watched more football and basketball. Almost like I had never left. Now I begin the process of getting back to reality. After 5 days of stuffing myself with delicious food, I am slowing down. I say I don’t want to gain back the 25 pounds I lost on the trip, but that is easier said than done. Food will always be my weakness, I just need to stay active while I no longer walk everywhere. More important than my physical appearance, is my future employment. I have briefly searched for jobs but don’t really know what to look for. I do have time and wont seriously tackle the problem until after Christmas. For the time being, I just try to keep hold of my adventure. I plan to maintain a slender figure and long hair. I plan to look at pictures regularly and try to remember little stories I can share. I already want to travel again, but have no money. I want to keep hearing and talking Spanish, but have no motivation. I want to go back and work in South America, but have few skills. And I kind of want to be a different person now that I am home. Maybe wiser, funnier, more confident, more interesting, more socially active, more socially responsible, more energetic, or just a better poker player. But I have only been back for a week and I was only gone 29 weeks. Maybe the only real changes will be fleeting and physical, with a sprinkling of useless knowledge that pops up at random times, like when watching “Romancing the Stone”. I will continue to enjoy spending time with family and friends that I so greatly missed. I know I will travel internationally again, but the most attainable current goal for myself while home, is to just be more active. There are lots of hikes around and a lot to do and see here in Portland. My last night bus ride in South America, was the most comfortable. With my own row and no stops, I got some sleep and overall just felt relaxed. Arriving at 8 am, my next goal was catching a local bus to the center and avoid paying $7 for a cab. I knew that rush hour would be busy and patiently waited. 2 packed centro buses just rolled by, ignoring the running and waving locals. 2 more stopped and I just sat and watched the mob squeeze in. The 5th bus, after over an hour of waiting, was the one. With enough space for me and my bags, I felt the thrill of victory. Though, I did upset the driver by accidentally leaning my pack against the door, preventing it from fully opening. In central Bogota, I went through with my plan to stay at the “Party” hostal and do some socializing. I have stayed at very few of these types of accommodations, opting for cheaper quieter local spots. Honestly, this isn’t really my scene. There is a another type of international backpacker, whose only goal is to find “The Party”. That is fine, I understand it’s more interesting than drinking at home and the alcohol is cheaper. Also, maybe they take in some culture and respect for their host country. But I have my doubts. These traveler’s stories tend to be more about how much they drank and getting mugged while stumbling home at 3 am. Maybe I am getting old, but my goals for international travel are: Experiencing what life is like in a foreign country. Learning the language and enjoying the food. Seeing amazing scenery. Finding adventure. Challenging myself. And getting a tan. Yes, I want to meet interesting people and share a drink, but my need is not quite as strong as others. Maybe that’s good, maybe bad. Antisocial? Not necessarily. Lonely? Sometimes. I like to think I am more confident, adventurous, and less dependent on others. Looking back on the trip as a whole, I should have been more social but I am glad I didn’t get caught up in the main flow, or “Gringo Trail”. Back to my current residence; “Musicology Party Hostal” has large dorm rooms with names like Reggae and Jazz, a bar, hammocks, TV lounge with massive hard-drive full of shows, free breakfast and dinner, free Internet and Wifi, and an overly friendly backpacker staff. Most visitors sleep in till noon, rarely venture out, get comfortable, and stay for weeks. It really hurts my Spanish and my wallet. But, I felt the need stay here and get one more last taste of the other lifestyle. In town; Christmas decorations are in full bloom, a large tree structure sits in the main plaza, and the marching bands now mix in some festive tunes. The weather has been terrible, with constant downpours and chilly air. But, I do feel that I have done the city a little more justice. Wandering down new streets, finding markets and new snacks. There is just something about walking and eating pieces of fried pork fat, that makes a person happy. I highly recommend it. Tomorrow, I have one last goal of catching a city bus to the Airport, then I can relax. My journal is running out of pages, my wallet is running out of bills, my last camera memory card is running out of space, my empanada goal has been met, and my bags are full of souvenir ponchos and Andean pan flutes. Yo creo que puede ser el momento de volver a casa. In Otavalo: I shopped, caught a bit of a cold, and ate market lunches. I had one interesting night amongst locals while eating dessert Empanadas and drinking a warm berry beverage. Two giggly young woman to my right, seemed to be making fun of the fact I was dunking my emps. The young man with them and an older lady to my left, asked me some simple questions and I gave them very simple answers. Mostly just smiling and nodding, while they said “gringo” a lot and laughed. The man somewhat jokingly said that I should pay for all of their food. I showed him my near empty coin purse. Then,when I handed the server money to pay for my snack, I pointed at myself and said “Solo para me”. They all laughed healthily and I departed with a bang. Feeling better Sunday morning, despite no medicine and little sleep, I began my journey toward Bogota. 2 buses and 2 mini-vans later, I was at the border. The skies opened up, rain poured down, lightning strikes could be seen in the distance. I should have known what was coming. My passport was handed to the man in uniform behind the window, he looked at passport, looked at screen, shook his head, showed me screen, I just nodded and said “Entiendo” (I understand), trying to explain what I went through 4 days ago. Apparently, nothing had been updated yet in the computer. I still had only an entry into Ecuador back in June listed, no exit and reentry. I was told many things: You wont be able to enter Colombia, you will miss your flight, you need to return to Peru, wait over there, go make 2 copies of each of these 3 pages, Amigo! make sure you come back (at this point I was a flight risk, hinting to him that I may go on without an exit stamp), wait, now you need to pay money for stamp, my boss is back in town and gas is not cheap (I said I don’t want to pay), wait, maybe tomorrow. Man then takes my passport again and heads out the door with 2 other officers, they hop into a small red car and go. I wait and watch as the now undermanned station gets busy. Tourists come and go with no problems. I feel somewhat special, but also am very worried. Again, thoughts of alternative methods of getting to Bogota/Home, run through my mind: I really don’t need a stamp, do I? Would it do any good if I jumped the unattended counter and messed around on the computer? What if I physically attacked one of the officers and held him hostage, as I crossed the border? Nah, probably would have an issue later at the airport. Do they run illegal immigrants over on boats to Florida? Colombia was easier. After a brief 10 minute wait and being told the system was down, my passport was stamped. I again had to sort through lies from taxi drivers to get my cheap public transport. From the closest town of Ipiales, I booked my passage for the city of Cali (11 hrs north, halfway to the capital) because it is cheaper than going direct. Suffered through a muggy night bus ride, worried about bandits, but got to watch “Jaws”. Arrived at 5 am: rain is falling, booked a night bus to Bogota, oddly combined my 2 large bags into 1 to avoid paying double for storage, killed time in casinos and walking streets. I found a cheap Blackjack table but had one of the weirdest experiences. They don’t believe in luck, and preferred to blame all of their defeats on the white guy. Whether I took 1 card too many or too few, I made an error and affected the whole table. One man lost a big hand to my left and really wanted the 10 I took, which busted me. He was visibly angry toward me. I am just glad I don’t fully understand what they said, though I do know a few of the curse words they used. They don’t like to gamble, and take advantage of the “surrender” rule frequently. I don’t agree and rarely did. That rule is not common back home and I admit that I don’t know how to properly use it. But I don’t feel I made any stupid moves. I just sat there quietly as my stack dwindled. It was fun but also very uncomfortable. Safe to say, I am on a run of bad days. Hopefully I can get some sleep on the ride tonight and smoothly get into a hostal in central Bogota. I am looking forward to doing the city a little better these last 3 days, than I did with the first 3. ¿Dónde está el mercado central? Even though my trip is entering it’s last week, I am not going to just set the cruise control, there is more adventure to be had. My time in Mancora was spent laying on the beach, watching the World Series, and eating fruit. Only my last day there provided clear sunny skies and sunburn, otherwise it was a little too cold to swim and a little too windy to read. One positive was the beach roaming Empanada guy who was willing to cut his price in half, allowing me to pad my count. I also seemed to be there over a holiday weekend, with more Peruvians than Gringos on the sand and souvenir shops in full bloom everyday. Now to the adventurous part: The prices for direct buses north into Ecuador were all very high. Thus I opted to cross the border with local transport and buy my long distance ticket in-country. The first leg was easy enough, a mini-van 2 hrs up to Tumbes for half the price of a bus. Upon arrival, a man poked his head in and promised a $5 bus ride up to Guayaquil. I ignorantly jumped at the chance and ignored the mild warning from a friendly local in my van. He said it was “dangerous”, and that word would become a common theme from strangers. Partly because this main border crossing on the Panamericana has been deemed the worst in South America. So, I hopped into an unmarked car with the seller and a driver. Light conversation is shared and he tells me that there will be a strike this afternoon at the border, shutting buses down, and that I needed to get one right away. We roll by a bus office and he yells out the window to a guy, asking if buses are running, and the man apparently says no. They continue to drive me through town, telling me that now my best option is for them to drive me across the border and arrange transport there, for $35. I laugh, tell them I only have 20 soles on me ($7), and flex the fact that I know more about the Ecuadorian bus system than they do. I ask them to stop and let me out, but again the words “muy peligroso” (very dangerous) are uttered as we are now a few kms outside of the center. They drive me back to the main plaza and I reluctantly pay them 5 soles. Mostly just glad to be out of the car and consider it a stupidity tax on myself. I should know better than to jump into an unmarked vehicle based on false promises, when I could have easily strolled the bus offices myself and gotten the same “deal”. I figure the whole thing was a scam, reading web forums, people have often had to pay in excess of $30 just to get out of those situations, I feel somewhat lucky. Plus, it was fun to have an argument in Spanish. After the brief ordeal, I walked across the street from where the guys dropped me and immediately was waved over by a mini-van loading up people for the last 30 minute stretch to the border. The public transport I should have looked for in the beginning and the type the shyster said didn’t exist. The van dropped me at the Peruvian migration office, where I was immediately met by a mototaxi driver asking for my passport and holding forms. I used my supreme intellect to decipher that he was not official and that exit stamp formalities normally aren’t handled by a man wearing Jordache jeans. A simple stamp in my passport by a man in uniform, and now the mototaxi guys wanted to drive me the last 1.5 kms to the actual line in the sand. I said I preferred a mini-van, and again heard the words “muy peligroso”, which caused me to chuckle. I ended up walking the remainder, feeling very safe at mid-day. It felt good to get into a bustling market area at the border, and to be back in Ecuador. I found the bus stations in Huaquillas and joyfully saw a direct bus to my next destination, Otavalo (15 hrs north and 3 hrs south of Colombia). I purchased passage for 4 pm, figuring that 3 hrs would be plenty of time to walk to the Ecuadorian immigration office and take care of business. For some reason, passport formalities are handled 3 km north of town, and I walked. A brief wait for buses to handle their business, and then I handed the man my documents. He looked over them, said some things, let his stamp sit idle, handed them back, and then waved me to some other place. I didn’t understand, and went over and asked another guy to look at my stuff. The problem was then presented to me: When I left Ecuador back on August 11th, at the remote border crossing in La Bolsa, they didn’t put my exit in the system. Plus, the stamp mark was blurred and date hand written. Apparently this was a problem. Now 1.4 hrs until my bus leaves town, I approached a 3rd man who told me 20 minutes. Sitting, waiting, nervous. After the time elapsed, I again presented my case. They got another man, who went in search of a 5th man to help. This man seemed to be “The Man”. Listening to him talk to the others leads me to believe that this wasn’t really that serious of an issue and that the others just wanted to pout. Probably upset with the other offices error and now wondering why they had to clean it up. Either that, or they were waiting for me to bribe them. The 5th man had me make copies of my passport and then I waited some more, while the man drafted a letter or stared at a computer for another 30 min. Time was running out. I checked my clock often, the time to pickup my stored bag had come and gone and departure was now 5 minutes away. This was the first time all trip that I had reverted to work mode, operating on little sleep and food, my stress level rose. I quickly went over my options: Could I make it through the country without any stamps? Are there checkpoints on my way to Colombia? Could I just get off in Quito and go to the Embassy for help? How bad could Ecuadorian prison be? With little time to get back to Bogota, I called the bus company, somehow communicated in Spanish, requested that they throw my “grande azul mochila” on the bus, and pick me up on their way north. It worked. Five minutes later I got my completed passport back, and 5 minutes after that the bus rolls up and I jump in. My window seat was double booked, but I didn’t really care. On the ride, I had a prime view of the widescreen TV and they showed a relatively entertaining movie with Robert DeNiro, Stephen Seagal, and Lindsay Lohan. A dynamic trio that aroused the most emotion from a bus I have seen all trip. Now in Otavalo, I plan to take it easy for another 4 days, before 1 more long bus ride to Bogota. I hope this last leg is a little less adventurous, but you never know. That stretch of highway in southern Colombia is known for frequent bus hijackings at night. Podría ser una buena manera de obtener una descarga de adrenalina.